If you have the HubSpot-Salesforce integration installed, you can manually sync contact lists to Salesforce, or manually sync individual contacts, companies, and deals to Salesforce. In the upper right, click the Actions dropdown menu and select Resync list with Salesforce. Please note: batch syncs may require a large number of API calls. Ensure that you have at least [List number] x 3 API calls available in Salesforce before you proceed. In your HubSpot account, navigate to your contacts, companies, or deals. Click the name of a contact/company/deal. 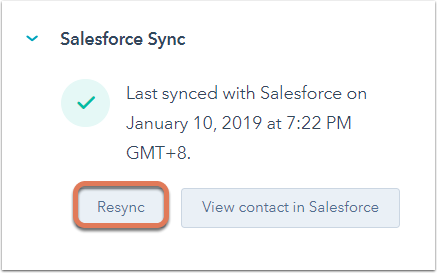 In the Salesforce Sync card, click Resync.